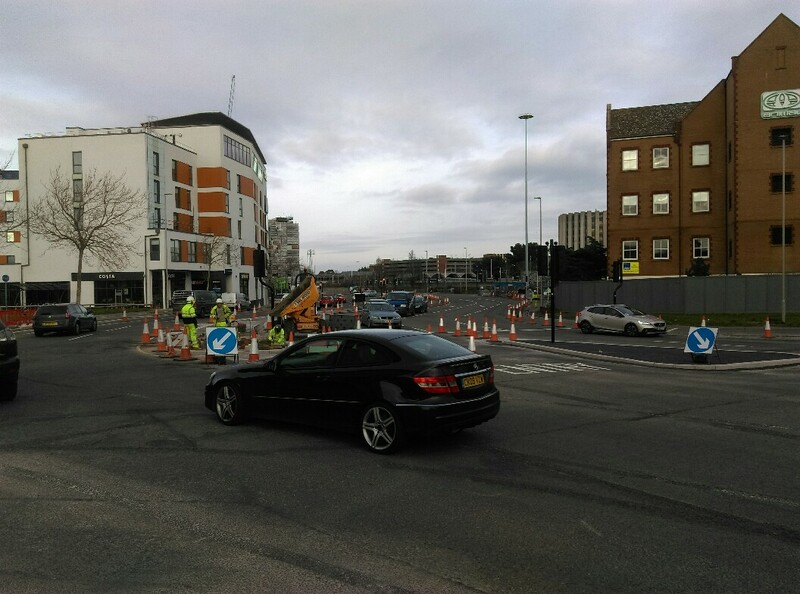 Traffic is now switched to the permanent junction layout, this appears to be running generally smoothly. Several folks have commented that the push button pedestrian crossings do not change to green. They actually do but owing to the traffic phasing it can mean needing to wait what seems like a long time for them to change and give a safe crossing period. Temporary traffic signals have been set up at the Asda junction and were commissioned early morning on 7th Feb. This will enable us to start works on the new Asda junction layout. First job is to flatten the small island that separate’s the turn right onto Vanguard Road heading out of Poole on Holes Bay Road. This will enable us to gain lane widths so we can finish the Holes Bay Road central reservation and then progressively work around the junction altering kerb alignement’s, installing drainage and ducts plus new sockets for 30 No new traffic signal heads and pedestrian push button signals posts. As you will see we are using the redundant roundabout as a materials storage area, this will eventually be turned into a landscaped area although currently it is not within our works package. Access onto Dear Hay Lane is now closed completely from the old roundabout and the proposed new West Street Junction for around 3 more weeks whilst we build the new link road and pavements. This is necessary as there is simply not enough width to allow vehicles, pedestrians and our workforce to carry out the required works. Dear Hay Lane will have a coloured pattern imprinted surface when we complete it. The pattern imprinted surface needs consistently warm temperatures to adhere successfully. Hence we will re-open Dear Hay Lane with a temporary surface as soon as we can then re-close for a few days around April to finish the surfacing, imprinting and colouring. Our works terminate just past the Brew House on the Chapel Lane car park entrance. Access onto Dear Hay Lane will still be possible with a short diversion from New Orchard as will access to Chapel Lane car park with just the section outside Brew House closed.